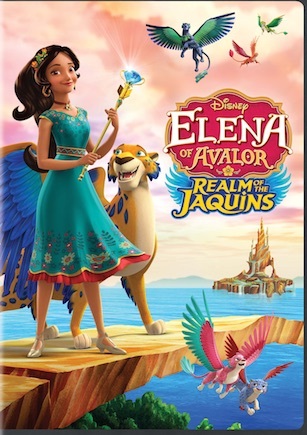 Three delightful episodes along with several bonus shorts make up this newest DVD featuring Elena of Avalor. Elena of Avalor: Realm of the Jaquins combines magic, music, and plenty of fun. 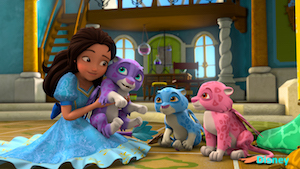 Three episodes (“Realm of the Jaquins,” “Three Jaquins and a Princess,” and “Shapeshifters”) are filled with color and music as Elena and her sister Isabel, along with their family and friends, encounter fun and fantasy. “Three Jaquins and a Princess” is perhaps my favorite episode because it shows the birth of three new baby Jaquins. These delightful and often mischievous little fellows get out of control when Isabel is watching them. They are so cute young viewers will undoubtedly want their parents to find them in the stores – and yes, they are available! There are many bonus shorts included on the disc. The first set of shorts all takes place in Vallestrella, a magical land with many different creatures. Vallestrella is the home of the Jaquins, but it is also the home to several other delightful critters. There are Butterfrogs, Sunbirds, Peabunnies, and more. Elena and her sister Isabel travel to Vallestrella to “observe,” but Isabel and the baby Jaquins decide to help out from time to time. The babies are a handful, to say the least. But they’re adorable, and Isabel can’t help but assist any creatures whenever she is able, even though her big sis Elena insists they are not to get involved. The shorts: “Flight of the Butterfrog,” “Sleeping Sunbird,” “Fast Food,” “Peabunny Boogie,” and “Human Nature” are all delightful. The second set of shorts involves Elena’s scepter training. “Scepter Training with Zuzo” are short lessons, each teaching Elena how to handle her magical scepter. Several times, however, she encounters a thief and uses the newfound powers of her scepter to stop him from getting away with items from the castle. The scepter allows her to see through walls, conjure up images, and make things invisible. Sounds like a lot of fun to me. All the shorts: “The Heist,” “Royal Treasury Escape,” “Nothing But Blaze,” “Stowaway,” and “Don’t Be Our Guest” are filled with magic and entertaining powers. The 10 shorts are great to play in the car. They are short stories that don’t require a lot of time but are entertaining enough to keep young minds occupied. Elena of Avalor: Realm of the Jaquins is rated Y for everyone.